Guess who turns the big 2-4 tomorrow? I'm sure you don't need any guessing on this one, but I am turning 24 tomorrow! I've been waiting 7 years for it to fall on a weekend again and remember thinking to myself, the next time this happens, I'm going to be 24, that is sooo old! But you know what? Now that I'm here (or almost there, let's not get ahead of ourselves), 24 isn't that old at all. From the time I was eight years old I used to tell my Dad, "No thank you!" when it came to birthdays, but this year, bring it on. But before I introduce my Birthday wishlist, I want to point out that it is in fact somewhat fictitious, as I know very well that Christmas just passed and let's be honest, that being said, I'm really in need of nothing. 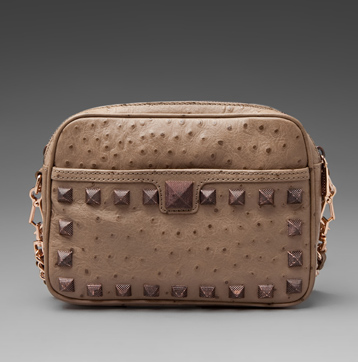 The moment I laid eyes on this purse I lusted for it. It was originally only on shopbop.com (imagine that!) but the Cameo Ostrich color has been sold out for quite some time now. I'm really happy to see that other websites have followed suit and now have this color available. Yes, it is just a tee shirt. Yes, it is $75. 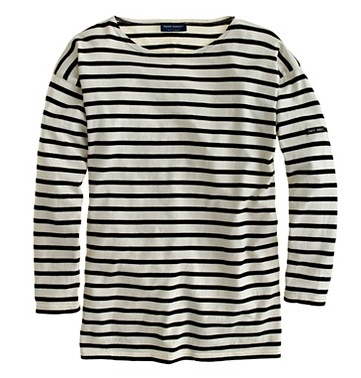 Hence, why I wouldn't get it for myself but I always love the crisp look of nautical stripes. This shirt at J.Crew comes in different colors, but this color in particular is Ecru Black. They are around every year, yet I still don't own a pair! 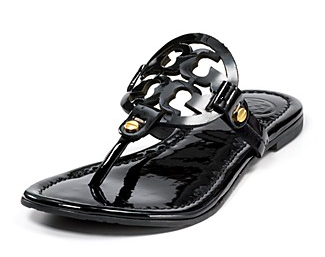 I think the whole Tory Burch flat obsession veered me away from this indulgence. However, black goes with everything and it is clear that patent leather and Tory Burch are not just a fad but are here to stay. Patent leather is also the easiest to clean off, so that is a plus!